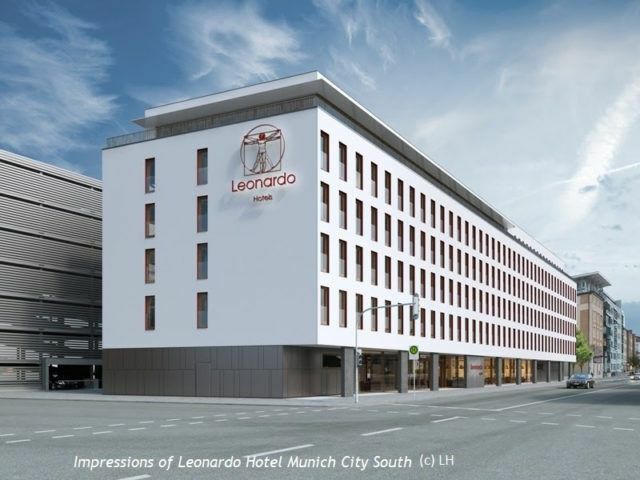 Right on time for the start of the Oktoberfest, Leonardo Hotels will open what is now its ninth hotel in Munich. After 18 months of intensive construction, the new Leonardo Hotel Munich City South has now been completed, displaying an impressive further development of the Leonardo design concept. The hotel reception area is flooded with light, gener-ously proportioned and transparent, while glass fronts throughout cause the building and the sur-rounding area to blend in with each other. The open lobby with direct access to the bar and restau-rant invites guests to make themselves comfortable right from the start. Warm, glowing pastel tones and a tailor-made lighting concept with RGB light provide strong accents. Local flair and the particular reference to the destination are presented with original motifs from Bavaria, the Alpine region and the traditional Oktoberfest – a real feast for the eyes. The concept is also extended to the stylish interior furnishings in the 159 comfort and superior rooms. One special feature of the hotel is the 247m2 conference area with an adjoining roof terrace as the ideal space for taking a relaxing break. Three light conference rooms with space for up to 150 guests are ideally equipped for events of all kinds. Other attractive features are a 24h reception service, Business Center, free Wi-Fi throughout the hotel premises and underground parking. Jacolien Benes, who until now has been the highly successful manager of the Leonardo Hotel Munich City Olympiapark, will take on the role of General Manager for this hotel.